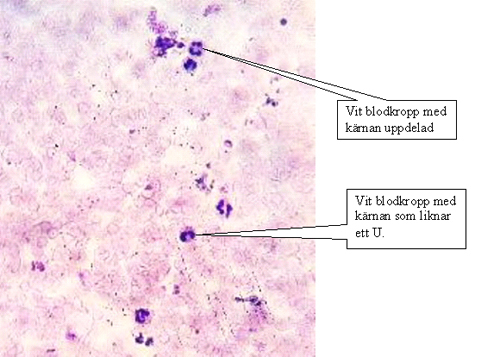 Eosinophils, neutrophils, basophils, as some of these white blood cells are called. They are grainy in structure, but the most characteristic is that the nucleus is divided into different lobes so sometimes it looks like there are multiple cores, sometimes it looks like a U. We stained them with methylene blue. As you may know, most of the white blood cells reside outside the blood vessels. We have in the body about 2.5 kg of white blood cells and approximately 1% are in our blood vessels. There is a concentration of them around our intestines, especially the colon. This is due to the large intestine where, where we have most of the approximately 1015 bacteria that we carry . 10 times more than our own cells. It is estimated that we have about 500 different species of bacteria in the large intestine. These we need to protect our body against and if we did not have our white cells or immune cells that we could call them, we would have no chance against the bacteria that is nature's smallest and most efficient decomposers. They would like to break down our body if they could. For them, we are only a large portion of wandering nutrition. White bloodcells with diffent shaped nucleus.